The mobile device industry has been around since 1973 when Motorola’s Dr Martin Cooper unveiled the first brick mobile phone; and it muddled along for years, focusing on selling connectivity units for really important people. Apple changed that around 2007 with the iPhone, which would have been okay if they hadn’t followed up with iTunes and followed that up with the App Store. Today, Apple and Google (yes, there are others, but really…) both have more than 700,000 apps people download and use for fun, business, more fun and the heck of it. 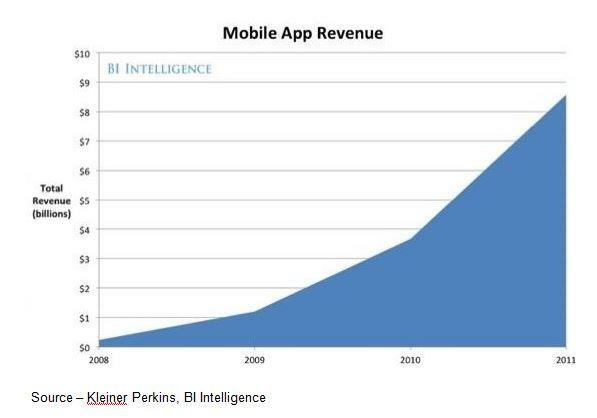 The combination of freemium apps (in-app ads, add-ins/add-ons) and going beyond smartphones to tablets, notebooks and even TV has helped revenues soar to an estimated $25 billion this year, according Mary Meeker of Kliener Perkins and BI Intelligence. Everyone In – It’s difficult to believe that a market that barely existed four years ago could now be producing $25 billion in sales, and it seems to have only just begun. In addition to freemium and paid personal apps, there is a growing and very profitable business market with apps being produced for virtually any task you can imagine. In this world without borders the app boom isn’t confined to just the Americas. App development entrepreneurs are everywhere, including China, Japan, South Korea, the EU and even developing countries. And with each new generation of mobile device even more apps – generalized and task-specific – are being developed and finding customers/users that connect to even more devices. A friend recently bought a new weight scale/app that connects to his smartphone, his computer and the web site to monitor his food intake, exercise, weight and … progress. While people buy their devices (regardless of breed) for all kinds of reasons, entertainment, social networking and games are still the most popular applications. Oh Sure – People upgrade their smartphone, get a new tablet or the latest ultrabook because “they need it to do their job better,” but the first apps that are installed are the games, social sites, entertainment stuff. Then, as time/space permits, they add the business apps. With so many apps at their fingertips, people are spending about two hours a day with them. Service providers didn’t care because folks were racking up minutes – an average of 127 minutes on mobile apps each day, 35 percent more time than a year ago. 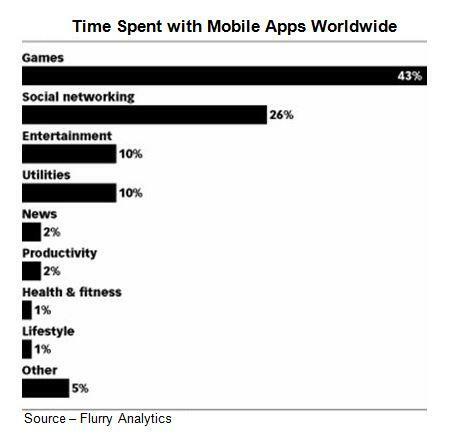 According to Flurry, mobile gaming led with 43 percent of the time spent with mobile apps worldwide, social networking accounting for 26 percent of the time, and entertainment/utilities were each10 percent. Speaking of business; the idea of letting folks buy/use their own iPhone, smartphone, iPad and “other device” for work sounded great for management … at the beginning. Work On-the-Go – Mobile devices – all three of them – have become an indispensible part of getting work done and staying in touch. Business people move their work from one device to another quickly, easily and almost too casually, often exposing sensitive information. After all, the bosses fell in love with the iPhone and then they had to show how leading edge techie they were with the iPad, so that cleared the way for everyone and the floodgate opened. Little Big Numbers – Smartphones top the mobile device chart in number of units sold and projected. Tablets are showing a big burst in volume and the options available. Portable notebooks are either relatively flat or taking a sales burst breather, depending upon your perspective. If you attend a conference or go into a meeting, you quickly see that the computer isn’t being replaced by the tablet or the smartphone. You probably have all three and maybe more. In fact, because the iPhone and iPad are the dominant enterprise mobile devices, according to Gartner, even the Apple Mac is increasingly seen around the office. Of course, there are still a lot of Windows, Androids and other devices – notebooks, tablets, smartphones – being used in the office, at home, at school, you name it. 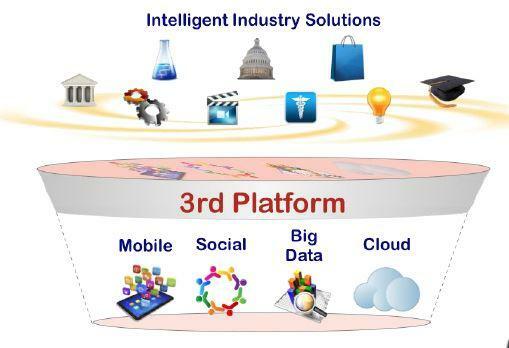 Third Platform – A couple of years ago, IDC introduced the concept of the “Third Computing Platform” – smart/mobile devices, applications, the cloud and social media. Now that the third platform is firmly embedded in the workplace, the challenge is to protect private and sensitive content. First, we had the mainframe and terminals. Then, we moved control and power out with the network/Internet, server and PC. Finally, we put the power in the hands of the user with mobile devices, social media, the Cloud and all of the information/content that produced Big Data. While organizations have developed apps for their business which folks download to help them work more efficiently and effectively, they are also downloading a lot of outside apps which can hide malware, Trojan horses and spyware that can attack and affect corporate assets. So Innocent – Whether the mobile device user is a seasoned veteran or a newbie, he or she is a wonderful target for hackers, cybercriminals and just about everyone. As you read the news and scour the Web, it’s easy to see that malware and cybercrime is becoming a popular sport for many and it’s surprising how easily we fall. Even the most intelligent man/woman can be hooked by cybercriminals or advanced longline phishing techniques that people keep coming up with. It’s no wonder that IT security, IP protection, governance and compliance have become so important to senior and system management. Most users commingle their corporate and personal information on their devices; and with more and more of your personal business being conducted online, people open themselves and their company to even more danger/exposure. Step Right Up – Hackers and cyberthieves use some of the most sophisticated approaches you can imagine to obtain your data or tap into the company’s data through your device. User information from banks is often liberated and set free. 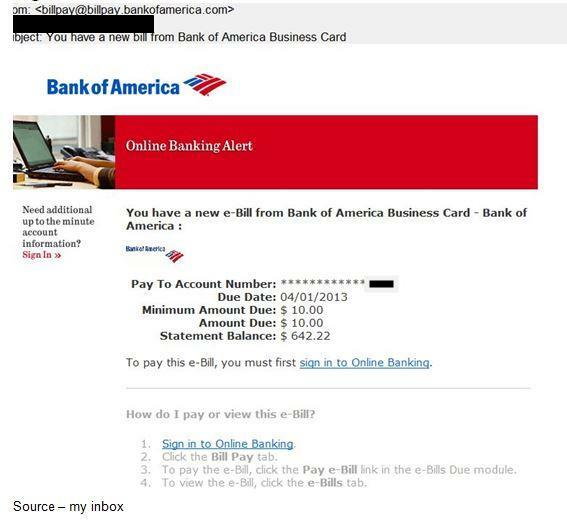 We might have considered responding to BofA and maybe even paid the bill if we had a BofA credit card. While Chinese (and other) hackers are a constant threat to IT management, they increasingly focus on controlling/managing/protecting data rather than the devices. To do this, they deploy robust corporate firewalls, encrypt confidential data and use other security techniques and solutions. Because people use their mobile devices to move content and communicate with personal, public and company private clouds, data protection is a never ending vigil. Personal devices and apps are projected to triple this coming year as people work with multiple devices across heterogeneous platforms. People bring their own devices, their own data, their own apps, their own communities; and they move personal/company information where it is most convenient, most useful for them. Next Gen – As each new generation matures and enters the workforce, they bring along with them their own devices, their own applications. They may learn from their elders, but they also have a very good grasp of what is needed now and tomorrow. It’s not just time and location travel of people and their data; it’s the kind of thing that will become even more of a challenge as the new age groups enter the workforce. They’ll be even better at working with newer/more powerful devices everywhere, anywhere.